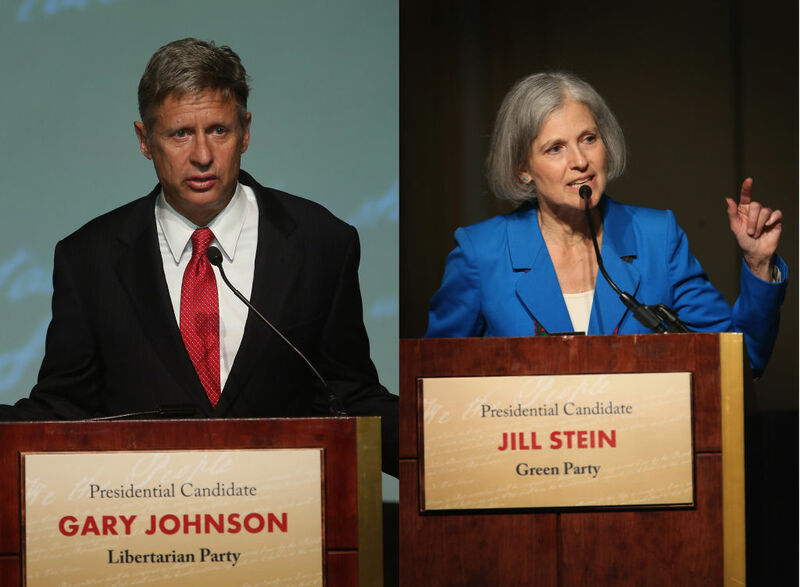 “If successful,” he writes, “it will permanently expand the number of candidates on the debate stage during the general election by proving that the Commission on Presidential Debates is in violation of current antitrust law.” In 2012, Green Jill Stein and Libertarian Gary Johnson “were not included in approximately 90 percent of the popular polls,” making it all but impossible for either of them to reach the CPD’s 15% polling threshold or to be reflected as serious candidates by the mainstream media. 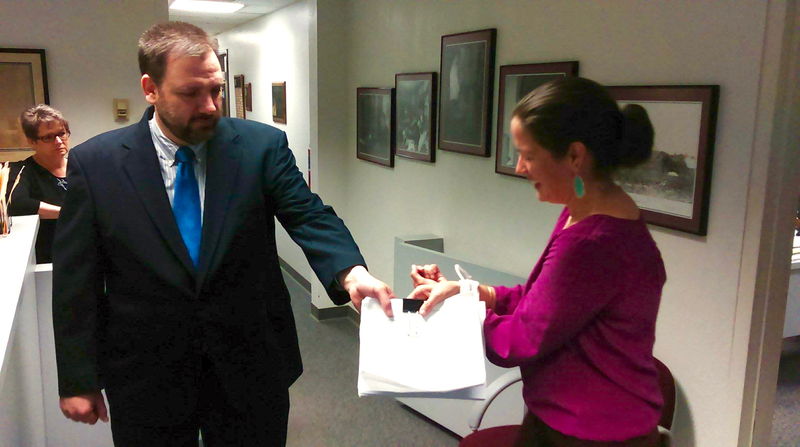 Bound by Oklahoma’s establishment-serving ballot-access laws, Cooperative Council Facilitator Rachel Jackson hands Election Board Secretary Paul Zuricks the party’s modest stack of petitions Monday, Feb. 29, 2016, at the state Capitol. Oklahoma requires the highest number of signatures of registered voters, per capita, in the nation to get new political parties on the ballot. Being new to the Green Party US and feeling a need to get out of town I signed up to attend the Annual National Meeting July 23 – 26 in St. Louis MO. I knew the way, having been there for the Black Lives Matter march last November. I arrived at the University of Missouri, St Louis campus and checked in just in time to catch the last half of the second workshop,”Using Online Tools for Effective GP Work”. I can tell you this, there is a push to help all chapters begin using the wonderful Nationbuilder web site tool. Much to my surprise, I was asked to participate Friday, along with the Green Party VP candidate Cheri Honkala and three others in the Activist Press Conference happening the next day. I spoke briefly on the We the People – Oklahoma effort to get a grand jury to investigate the Tulsa County sheriff and also a bit about fighting the KXL tar sands pipeline. Friday afternoon I had four workshops to choose from and I chose “Campaign School: Campaign Video Production”. They had recruited some real pros for this one. I take pictures at nearly all events I attend and I’ve done some video editing but these people were very good! Saturday there were more workshops, followed by a rally across the street from the Ferguson Missouri police department with Jill Stein and others speaking and sign waving and we all had a great time. After dinner there was a candidate forum with five Green Party candidates for President speaking. Immediately following there was a chance to get your picture taken with Presidential candidate Jill Stein (see above). To round off the day there was a pool party! I met lots of great activists and had a great time.